The Chris Christie scandal shows the danger of big government, no matter which party is in charge. We now know that Chris Christie’s deputy chief of staff Bridget Kelly and other assorted Christie cronies abused their power as government officials to punish Christie’s political opponents. The apparent target was Mark Sokolich, the Democrat mayor of Fort Lee, New Jersey, who refused to endorse Christie for governor. “Time for some traffic problems in Fort Lee,” Kelly famously wrote in an email to the political appointee who had the power to close down two lanes on a Fort Lee access ramp that funnels traffic onto New York City’s George Washington Bridge. As a result of these unannounced lane closures that lasted several days, people had to sit four hours in traffic jams. At least one elderly woman died while in an ambulance that was stuck for hours in gridlock. And emergency vehicles could not respond to 911 calls in a timely fashion. So, most likely, others died as well as a direct result of this breathtaking political vindictiveness by Bridget Kelly and other Christie cronies in positions of power to carry out the lane closures. This is not how a civilized free society is supposed to work. We still don’t know what Chris Christie knew and when he knew it. My own view is he should resign over this even if he did not know. By surrounding himself with top aides in the mold of the evil Bridget Kelly (along with all the others who were in on this destructive escapade), he has shown he is unable to govern. Leadership comes from the top. The governor sets the tone for his administration. The people who work for Christie take their cues from him. If Christie did know what was going on, he should be prosecuted and sent to prison. Of course, this is exactly the behavior we see with the IRS scandal — where President Obama’s political appointees and assorted leftists at the IRS are abusing their power to target the Tea Party, other conservative groups, and political opponents of Obama with punishing audits. Whether Democrat or Republican, political appointees and bureaucrats will abuse their power — which is why principled conservatives want to limit government power, limit the power bureaucrats and political cronies like Bridget Kelly have over our lives. Now we have the specter of ObamaCare — where political cronies and bureaucrats will be making life-and-death decisions over who gets the medical treatment they need, and who won’t. Who’s to say that a leftist ideologue in the HHS-ObamaCare bureaucracy won’t deny a liver transplant needed by a Tea Party leader? Who is to say leftists in the ObamaCare bureaucracy won’t check party identification on voter registration rolls before giving the green light to medical treatment? This is exactly what’s likely to happen with government-run medicine — government-run anything. Richard Nixon had his “enemies list.” Nixon was looking at ways to use the Federal Communications Commission to punish the networks (ABC, CBS, NBC) for criticizing him. Nixon also used the IRS to target his opponents, as did JFK and FDR. Whatever government runs becomes politicized. Private companies do not set out to deliberately inconvenience their customers because they are driven by the profit motive. So they are eager to serve. And businesses could not care less about the political affiliations of their customers. But political appointees and government bureaucrats are not driven by the profit motive. They are driven by the quest for power and the prospect of feeding at the government trough at taxpayer expense. Some government officials, of course, want to use their power for good. But others like to use their power to push people around — even to punish people they don’t like. Chris Christie’s deputy chief of staff and assorted cronies got caught because they were stupid enough to reveal what they were doing in emails and text messages. Political appointees and bureaucrats in government abuse their power all the time, everyday. It just doesn’t usually make the news. Bureaucrats don’t need political motives to abuse their power. Many abuse their power simply because they can. They are unhappy with their life and they take it out on whoever is unfortunate enough to be in their crosshairs, whoever happens to be standing in front of them at the moment. Every day we read news stories about out-of-control cops who beat someone senseless for no good reason. I’ve met many excellent government officials, many great cops. No doubt most are honestly trying to do a good job and serve the public the best they can. But it doesn’t take many bad apples in government to make life a nightmare for many of us. Of course, we need government because we need law and order. We also need government build roads and infrastructure, regulate commerce, take on big projects that can’t be handled by the private sector, provide for a social safety net, and to defend the nation from foreign enemies. What James Madison and America’s founders tried to achieve when writing our Constitution was to establish a government that was very strong where government must be strong, but also limited in scope. So James Madison and the founders set up a federal government with specifically enumerated powers. In other words, most of the governing in America was supposed to be handled by state and local governments — on the principle that government governs best when it’s close to the people. Also on the theory that if government in one state or locality is behaving badly, we would have the ability (the freedom) to move to another state without having to flee the country. There would then be free-market competitive pressures on the states to have good government and to be attractive places to live. The central government’s role was supposed to be limited to national defense, general law and order, establishing a currency, and regulating interstate commerce. If the federal government actually followed the Tenth Amendment, our federal government would be about a third the size it is now. The Constitution’s framers also sought to limit the power of the federal government by dividing power equally between the branches. Congress and the President are supposed to be co-equal branches of government, with the Supreme Court (and other federal courts) making sure laws are followed and that laws passed by Congress are Constitutional. But most of the governing was to happen at the state and local level, with the federal government stepping in only as a last resort — to quell rebellion, to end slavery, to safeguard the vote, and those sorts of big issues. America’s founders knew human nature. They knew those in positions of power would abuse their power — not all, but enough. Adolph Hitler was just one person. But he was certainly able to do a lot of damage when he had the reins of power, as did Stalin, Mao, Napoleon, Caligula, Pol Pot, Idi Amin, and so many other tyrants. The vast majority of people throughout world history have lived under tyranny. The little tyrant of North Korea, Kim Jong-Un, summarily executed his uncle along with his uncle’s inner circle – apparently making the decision while in a drunken stupor. He had the power. He murdered his uncle because he could. He was annoyed with his uncle, or something. Power often turns the people who have it into monsters. Chris Christie’s deputy chief of staff is a little Napoleon. She was willing to use her power in government to hurt the mayor of Fort Lee in any way she could. She probably would have been happy to put him in front of a firing squad if she could. She closed down two lanes of traffic on one of the busiest stretches of road in America because she had the power to do so, without any concern for the damage she was causing. At least one person died as a result. And she needlessly inconvenienced hundreds of thousands, if not millions, of people — plus damaged the economy of the entire New York City area by closing those two lanes of highway for no reason other than spite. This is the effect power can have on people’s minds. The ring in the Hobbit is a metaphor for this. If you put the ring on, you acquire near limitless power, but also become evil. Power often transforms otherwise decent people into lunatics. Adolf Hitler was a hero on the battlefield in World War One. Hitler’s evil racism and anti-Semitism could not have consumed the lives of millions, and he might have been an otherwise upstanding (and long forgotten) citizen had he been a shopkeeper, instead of Germany’s top government official. It was the power to put his racist fantasies into effect that fueled his megalomania and murderous insanity. This is why we need limited government. It’s why we need smaller government. It’s why we need all kinds of safeguards to keep government locked in its cage and tethered to its post – to make sure government only does what’s it’s supposed to do. It’s why the out-of-control government we have now in America (at all levels) is so dangerous. It’s why America’s founders were so right, and it’s why the Constitution they wrote was so brilliant. Of course, it’s not a perfect document. Politicians have found ways to get around the Constitution (mostly by ignoring it) to grow government to a point where it’s now completely out of control. Do you really believe all this data being collected on every American by the National Security Agency (and other government agencies) will never be used for nefarious purposes by those who have access to all this data? What’s to stop an NSA analyst from using this data to see what an ex-girlfriend is up to — or perhaps just to ruin someone’s life? What’s to stop a President and his political operatives from using this giant NSA database as an opposition research operation? 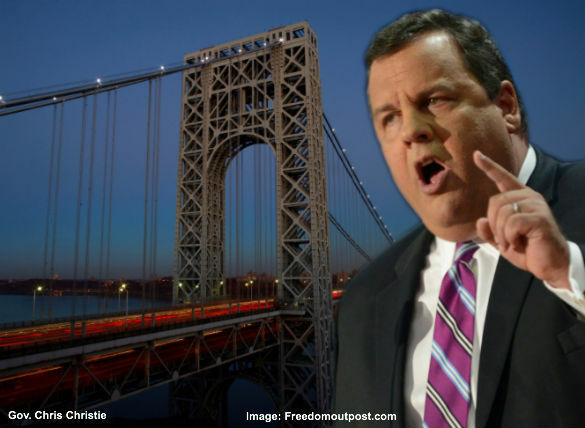 The Chris Christie Bridgegate scandal is just the latest example of government officials abusing their power because they can — to vindictively punish people they don’t like, or for no reason at all. The lesson is: We need to return to the Constitution. We need to UNDO ObamaCare — arguably the most serious threat to liberty in America’s history. But we must go way beyond that. We need to scale our federal government back down to Constitutional size — which is probably about one-third the size it is now. Submitted by David Givens on Mon, 01/13/2014 - 16:05. Submitted by Dr. Thomas E. D... on Mon, 01/13/2014 - 14:21. Not one of our first six presidents attempted to subvert our constitution or any part of the Republic. Andrew Jackson had a notion that he had been popularly elected with a mandate to do things his way. He did NOT! Since his time, the Democratic Party has ramped up Jackson's "Spoils" system and several have done their best to become a dictator. Woodrow Wilson who sold out for $40,000, appointed Louis Brandeis, an Arch Zionist to the SCOTUS. Brandeis who was a trusted confidante of Wilson, advised Wilson that a German submarine had sunk the SS Sussex in the English Channel with the loss of American lives. That was a bald -faced lie, but Wilson took it hook, line and sinker, asked Congress for a declaration of war against Germany and her allies, likely an act of Treason costing America over 116,000 killed and over 200,000 wounded, http://www.pbs.org/greatwar/resources/casdeath_pop.htmlAll this for the vanity of the fool who brought us the Federal Reserve, Income Tax an a progressive agenda.FDR also had a progressive agenda, much of which a watchful SCOTUS found to be Unconstitutional. Roosevelt won a secind term in 1936 and in early 1937, annnounced his intention to "Pack" the Suprme Court with additional judges amenable ti his progams, aims and desires. A heat wave scuttled that illegal maneuver.http://en.wikipedia.org/wiki/Judicial_Procedures_Reform_Bill_of_1937 Carter, Clinton and Obama are three more Democratic scoundrels with notions of turning this fantastic Republic into a Socialist/ Marxist Democracy/Dictatorship. Obama is only one of at least three /chief executives guilty of Treason and subject to trial for that heinous offense. The 113th Congress is duty-bound, (by Oath) to bring Obama and members of his administration to trial for Treason, Murder and other High Crimes and Misdemeanors. Submitted by rosugill on Tue, 01/14/2014 - 09:59. Hold your breath until justice is done relative to the above.